Perdue Farms, Inc. is the United States' third largest poultry producer, based in Salisbury, Maryland, and founded in 1920. It is a privately-held company. As such, it does not always make its annual revenue public, but the company claimed it had $4.6 billion in annual sales in July 2011. The salary of the company's chairman and CEO, Dr. James A. Perdue, is also not public. 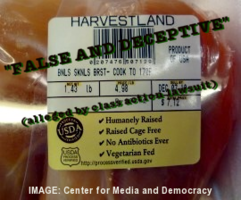 1.1 Class Action Lawsuit Alleges Perdue's "Humane" Poultry Claims Are "False and Deceptive"
Class Action Lawsuit Alleges Perdue's "Humane" Poultry Claims Are "False and Deceptive"
A consumer class action lawsuit alleges that Perdue Farms, Inc. has misled consumers by advertising its Harvestland brand of chickens as "humane." The suit was filed by two members of the Humane Society of the United States (HSUS) on behalf of a group of consumers. The case has been cleared to move forward, according to a decision issued on March 31, 2013 by a federal court in New Jersey. The main thrust of the lawsuit is that, contrary to the claim that the birds are "humanely raised," Harvestland's chickens are "shackled by their legs, upside-down, while fully conscious; electrically shocked before being effectively rendered unconscious; cut ineffectively or partially while fully conscious; drowned/scalded while conscious; stored in trucks for hours under excessive temperatures; subject to lighting conditions which result in eye disorders; injured in the process of being removed from their shells; subject to health problems and deformities due to selective breeding; and provided no veterinary care." One of the lead plaintiffs, Nadine Hemy, alleged that she would not have purchased the "premium-priced" chicken if she knew the chicken was "not in fact treated humanely" or differently from other chicken on the market, throughout the chicken's life, according to documents from the case. ↑ 1.0 1.1 1.2 Perdue Farms, Incorporated, Bloomberg BusinessWeek, accessed April 2013. ↑ Perdue Farms, Incorporated, About, corporate website, archived by the WayBack Machine on July 19, 2011, accessed April 2013. ↑ 3.0 3.1 3.2 United States District Court, District of New Jersey, Nadine Hemy and Nancy Conner v. Perdue Farms, Inc. Memorandum Opinion, Civil Action No. 11-888 (MAS) (LHG) court opinion, issued March 31, 2013. ↑ Animal Welfare Institute, Humane Methods of Slaughter Act, organizational website, accessed April 2013. ↑ Company Overview of Perdue Farms, Incorporated: People, Bloomberg BusinessWeek, accessed April 2013. This page was last edited on 1 April 2013, at 19:58.